White Wedding Cakes - Custom decorated wedding cakes Long Island New York. What better way to celebrate matrimony in New York than with our white wedding cakes. We have many standard cake designs to choose. Don’t worry if you’re indecisive type we will work with you to create the perfect design for your custom wedding cake. Customers love our white wedding cakes due to the traditional look and feel. The cake pictured above is wrapped in white chocolate fondant and decorated with over 50 handmade pink roses. Inside is 3 tiers of pure chocolate sponge cake. The filling is layers of a delicious non-traditional oreo buttercream filling. All of our white wedding cakes pictures are example of our delicate touch and attention to detail. We can always send you additional photo samples of our cakes upon request. For your convenience, we have many flavor and decoration options to choose from. Choose from all buttercream icing, a square cake, real flowers, or one of our non traditional wedding cakes. Traditional white wedding cakes are the most popular, however we are seeing many more unique cakes for that special day. They are used as the perfect way to celebrate events such as the first place you met or favorite sports team etc. We can also create handmade wedding cake ornaments or figurines to use as a cake topper. The possibilities are endless. 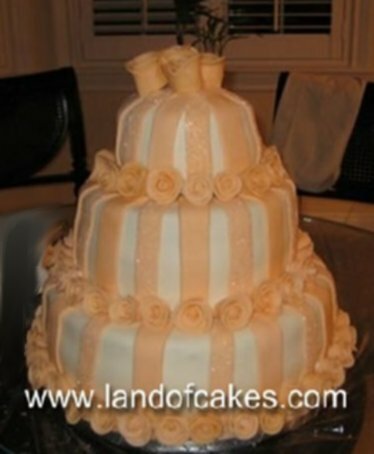 For your special day choose Land of Cakes New York to customize the perfect wedding cake.